Day of rest. Went to church. We had our regular set of meetings. Then in the evening there was a special missionary fireside. The leaders of the Church announced that will be some changes in the way we do missionary work with missionaries doing tours of meeting houses, and using social media to reach out to those who may be interested. People do not really know us. They might see us, they might even occasionally associate with us, they may think they know us but they do not really understand what makes us tick. We at times do not live our religion as well as we should which is perhaps because we do not understand it as well as we should. Over the course of the years I have been privileged to have spent time with people that understood Mosiah 2-4, Alma 34, Moroni 7, and other powerful parts of the Book of Mormon. What a difference that made! Unfortunately in the majority of wards such people are found in minority. The average active member is a nice guy - he just does not understand some things, and because of that is not able to exert the power of the Gospel in his life in sufficient measure. The outsider looks at him as says - well, I am a nice guy too, why do I have to change anything? A.M. Did 12 miles total. Benjamin did 8. Jenny and Julia did 3. Joseph did 3, Jacob 2, William 1. I did 1.5 miles to the house uphill in 8:33. A.M. Total of 12. Benjamin and I paced Logan on the track to an 800 PR of 2:29.7. Benjamin and Logan did 5.5, Andrew did 5.25. Jenny did 3, Julia 3, Joseph 3, Jacob 2, William 0.5. A.M. 12 total. Benjamin and I did a 200 pickup in 34.3. Benjamin did total of 7. Jenny did 4, Julia did not run - she sliced her foot in an accident, and will be out of commission for a couple of days. Joseph did 3, Jacob 2, William 0.5, Andrew and Logan 5. P.M. I had a thought to ask our friend Lou who is a professional car mechanic to fix our stroller. My faith in car mechanic's ability to fix mechanical things of other nature was confirmed. Lou figured out how to bend the swivel brace back into shape and I was able to run 3 miles with Matthew in the stroller. A.M. 12 miles total. Benjamin did 7, Logan and Andrew 5, Jenny 4, Joseph 3, Jacob 1. Benjamin and I did a couple of pickups to help him feel race pace - 300 in 53.3, and 200 in 34.6. P.M. Took Benjamin, Jenny, Julia, Joseph and Jacob to chess instruction by GM Rashad Babaev. This was the first time any of us have met a grandmaster. It was an educational experience. We were studying a position where there was only one right move. We had 10 minutes to find it. Benjamin did. I asked GM Babaev how long it takes a GM to see something like this. His response that he sees it right away, it feels good, and because it does he starts calculating what would happen if he made it. The difference between a class A player or even an expert and myself (class B) is that they see tactical traps more consistently. However a GM sees more than that - he sees long-term positional weaknesses that can actually be exploited, and he sees the path to make it happen. He also intuitively knows if he can deal with various tactical issues that may arise on his way to exploiting the weakness - there are many lower skill players that can observe the weakness, but unlike a GM they only observe - they cannot do much about it. A.M. Total of 10.5. Benjamin did 3, Andrew and Logan 5, Jenny 4, William 0.5, Joseph 3, Jacob 2. Drove to Cedar City with Benjamin for the Utah Summer Games. 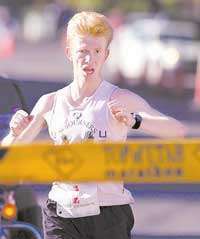 P.M. Benjamin ran 800 in the Utah Summer Games in 2:16.25 missing the official Utah State Youth record by 1.74 seconds. The official record belongs to Eli Oftedal and is 2:14.51. However, the Utah Summer Games record is listed as 2:11.00 by Sam Hoyal in 1993. I contacted USATF about the discrepancy, and what we were able to figure out is that in 1993 Utah Summer Games was not sanctioned by USATF, thus the record was not official. Regardless, I was happy with Benjamin's performance. The temperature was 100 F. When we got out of the van I told Benjamin he would gain an appreciation for J. Golden Kimball's "If I had a choice to go to St. George or to hell, I'd go to hell". We did a trick though. We brought the vehicle with the best A/C system of the ones we own. So Benjamin sat in the van until it was time to warm up. He jogged for 5 minutes, then did 2 strides. Back in the van to cool off for 5 minutes, and out to the start of his race. They combined the Youth division with everybody younger, and the other heat had everybody older. This was unfortunate because that resulted in Benjamin running alone. His opening lap was 65.5, and he closed with 70.6 on my watch - 2.16.1 total. Official time was slower likely due to automatic timing which is always a little slower than hand timing. Ironically, our blogger Eric Lambert who is 15 and with whose family we are staying ran the race as well in the other heat and finished in 2:16.29 with the opening lap of 62. Had they been in the same heat we might have seen Eli's record go down with them duking it out in the last 200. The good news is that they are scheduled to run in the same heat tomorrow. Later in the evening I ran 5 miles with Eric. A.M. Ran 16 miles in Cedar Cit. First 6.6 with Eric Lambert's father Adam. Then 2 with Benjamin for his morning shakeout. Then I wanted to find a place that was flat. The only flat place was the track. To help time pass quicker I decided to do a 5 K tempo run. Figured at 5700 feet and with the sun coming up 18:00 would take work, and I was not mistaken. I started out with 86 laps, but once I got to 3K all of a sudden the same effort started giving me 89 laps. At this point I understood why distances over 3K receive a much higher altitude adjustment. I decided to maintain the effort instead of forcing the pace. Then in the last lap I ran 81 and finished the 5 K in 18:04.2. I could really feel the lack of oxygen. Then I ran some more to make the total 16 miles. Then I watched Benjamin and Eric races the 1500. The race started at around 11:20 AM, and the temperature was 88 F. Eric took the lead and hit the first 300 in 55.3. Benjamin heard that and took over. Their next lap was 71.8. Eric took over at the 600 mark. Then he heat got to both of them and their next lap was 74.0. I yelled at Benjamin to floor it, and they shifted gears. Their last lap was 70.2. Benjamin got 4:31.58 - Eric outleaned him by 0.08 with 4:31.50. For Benjamin this is a new PR. He missed Josh's record set in the same race 17 years ago by 2.22 seconds. I was quite happy with Benjamin's performance. This is on pace for 2:07:19 marathon. Now he officially advanced his ability to run that pace to the 1.5 K point. Another 40 K to go. Maybe less - this was in 88 F and at 5700 feet. He would last longer at that pace at sea level in ideal conditions.